Hemkund Sahib or Hemkunt Sahib is the world’s highest Gurudwara, situated at a height of 13500 feet above sea level. It is situated in Chamol district of Garhwal Region in the state of Uttarakhand in India. It is tough to reach Hemkund Sahib as it requires long and tiring road journey from Haridwar to Govindghat and then trek of 21 km from Govindghat. This trek is done in two days, first day you will be going only up to Ghangaria. 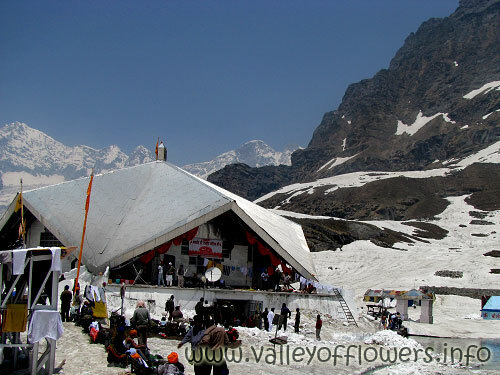 Ghangaria is the base camp for Valley of Flowers and Hemkund Sahib Trek. Nature lovers coming for Valley of Flowers trip go to Hemkund Sahib also but most of the pilgrims coming for Hemkund Sahib do not go to Valley of Flowers. Hemkund Sahib in June , The lake is frozen and you will be trekking through snow for 3 kilometers. Hemkund Sahib in September, You can see Neelkanth Peak on right side. 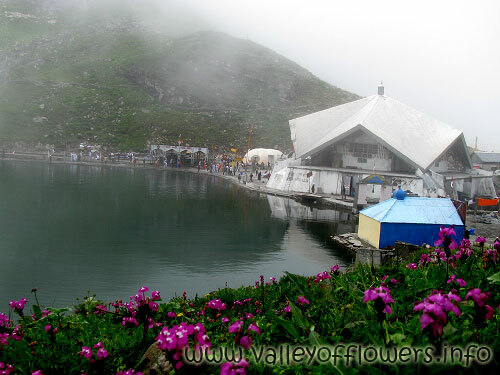 Hemkund Sahib in July, the weather is very cloudy and changes very frequently. 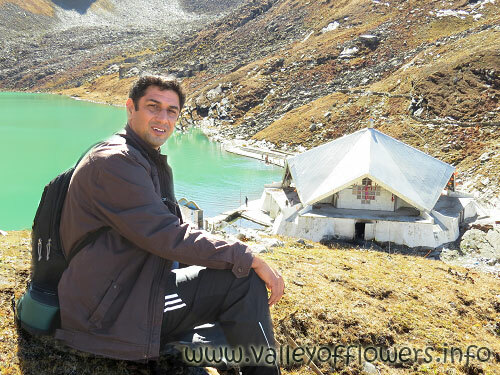 Hemkund Sahib in October 2013, when I went to see the Valley of Flowers. It is believed that the last Sikh Guru Gobind Singh Ji worshiped here for years. In Chapter six of Bachitra Natak Guru tells his previous birth. 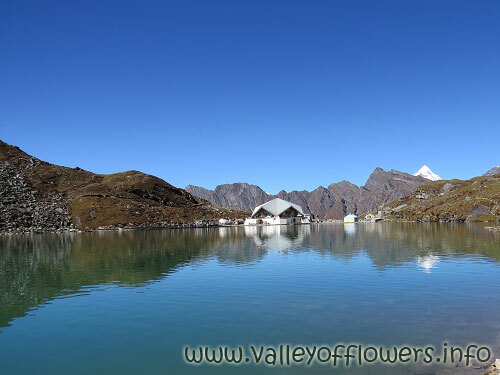 He tells Hemkund peak and lake of Ice with mountain adorned with seven peaks. Hemkund Sahib is always cold throughout the year. It is accessible only for 4 months in a year from June to September and rest of the time it is full of snow. Even in the month of June the lakes is frozen and again in September end mostly snow again start falling. No one is allowed to stay overnight at Hemkund Sahib only the Sewadars at Gurudwara stay there. After the last prayer at 2 pm everyone is sent down to Ghangaria. The weather at Hemkund Sahib changes very rapidly. Helicopter service is available from Govindghat to Ghangaria and you can skip trekking from Govindghat to Ghangaria. Helicopter service is too much dependent upon weather conditions. You cannot rely on it especially in the month of July and August when monsoon is in its full swing. It takes only 3 min from Govindghat to Ghangaria by Helicopter and charges are Rs. 3500 (In 2012). You can expect an upgrade in these charges by at least 10 % every year due to inflation. You need not book the ticket in advance as no one knows the Helicopter will fly or not on a particular date. So you can simply go and take the ticket and ride it. i want to visit Valley of Flowers around 20 to 28 October with my family of four pax. can i get helicopter service from govind ghat to ghangharia during this period. and whethter it is safe and advisable to visit the valley during this period. what if chopper service is not available. Hello, You need to pre-pone your dates Valley of Flowers is open till September end only. A detailed itinerary has been sent to you please go through it or you can call us on 9991242759. Hi Wish to Go for darshan for Hemkund saheb in September 2018, please send iteniary for helicopter from Gobind Ghat. We are planing for trip to hemkund sahib from delhi in July. Please provide iternary including helicopter ride till गोविंद dham. Hi. I want to go only to Valley of Flowers and not hemkund. Can you give details including price? My email id is 27.niyati@gmail.com. Travelling dates around end of June or July beginning. I’m panning to visit Hemkund Sahib within 1st to 4th June 2018. Could you please guid me for the same. My son 7 years old will be with me for the trip. Is it ok or not for him? Currently what are the charges for Helicopter ride and ponies? We are planning to visit Hemkund Sahib during 5-7 June 2018. Is there enough snow this time, because we never see snow in real and we are keenly interested to see snow along with Gurudwara darshan. I am planning a visit to Hemkund Sahib and would like to book helicopter service for 7(5 adults,1 kid and 1 infant) to ghangaria. Please let me know the fare for return(to and fro) and also please suggest if ponny service is available for senior citizens(2) from Ghangaria till gurudwara sahib? (how much they charge). hi we planning to visit hemkund sahib and the valey of flowers and would like to book a helicopter.. but we are a group upto 50 people what are our options in august..
We are looking panning to visit by July 15 this year. We would like to do helicopter ride as a part of journey. We are four people . Thanks for contacting us again for the trip. We have sent you a detailed itinerary. Looking forward to the trip starting 28th July15…. Really we are greatfull to you.very nice photographs. Hi there, God gave me the chance to visit this beautiful place when it was natural and not many people visited. I didn’t get a chance to visit Valley of Flowers. I am hoping to pay homage at Hemkunt sahib and then see Valley of Flowers. You are really lucky to have visited the Valley of Flowers continuously since 2004. I visited Shri Hemkund Sahib in the year 2007. Let me tell you your photographs really took me back to the time I visited the beautiful place. The place is unforgettable.Hoping to visit Valley of Flowers and Hemkund Sahib in near future. Do continue your excursions and share your images of the heavenly place with us. God Bless You. Surely you are most welcome to come with us. 2015 departures have already been announced. Kindly visit Valley of Flowers opened in 2014 for the latest information about Valley of Flowers. Ipomoea purpurea is a twinging, hairy herb with stem of height upto 3 m. Flowers are deep purple in color with red or pale pink centre. Flowers are mainly funnel shaped.